Every key on the mechanical keyboard has its own independent mechanical key switch machanism, delivering crisp response and tactile feedback for a completely different feel. Mechanical Blue Switches: Actuation force of 60g. Reduced actuation distance of 2mm. 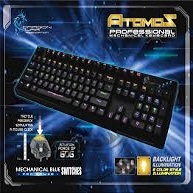 Support up to Unlimited keys, now several key commands can simultaneously be perofrmed quickly and precisely during action-packed gaming situations.